My copy of Cujo is 345 pages long and as soon as I opened up the book and started to read I noticed it has no chapters to split up the story. Instead there are just occasional spaces between paragraphs to mark a change of scene etc. I have only ever read one other book, as yet, that is set out this way and that book was King’s Dolores Claiborne. A book without chapters is a little unusual, but you soon get used to it and a good story is a good story is a . . . well, you get the idea. At two-hundred-pounds, young Brett Camber’s Saint Bernard, Cujo, is a big dog. He is also a good dog and tries to do everything that the Camber’s expect of him. But when Cujo gets scratched by a rabid bat, and the sickness eats its way into his brain, he becomes a two-hundred-pound killing machine. Cujo is quite a sad story because even though the big Saint Bernard is the bad guy (dog) of the book, it is not his fault and he is as much a victim as the people he terrorizes or kills. There are some interesting characters in the book and some good sub-plots centered around them. Like the Trenton family for instance. If you decide to read Cujo you will become well acquainted with the Trentons because, if you forget about the dog, they are the main characters in the book. Vic Trenton is a partner in a small advertising business and, through no fault of their own, he and his partner, Roger, are in danger of losing their main client. If they do it could pull the rug out from underneath their whole business, so it is pretty fair to say that Vic is a worried man. Vic is not the only member of the Trenton family to have worries, his four-year-old son Tad appears to have a monster in his closet. And as for Donna, Vic’s wife . . . well; she has a skeleton in hers. The Camber family also feature heavily in the story. They own Cujo, after all; so it would be hard for the reader to get to know Cujo without spending some time in the company of the people who have shared his life. Joe Camber is perhaps not the nicest man to step out of Castle Rock, but he is damned good mechanic and damned cheap one too. Joe’s wife, Charity, has had a hard life with her man, and fears that her son Brett will grow up to be just like his father. When Charity comes into rather a lot of money, however, the money also brings a problem: how can she talk her husband into allowing she and Brett to visit her sister in Connecticut? While the Cambers and the Trentons are dealing with their various problems poor old Cujo is not feeling very well at all. It seems that no one in Castle Rock is having a very good time of it and as the story progresses things get worse all around. I have noticed, when reading Stephen King novels, that characters from one book have a habit of cropping up in another one. Reading Cujo I noticed that a few characters from The Dead Zone turned up in the story. I only mention this because I quite enjoy the way King works bits of one story into another. 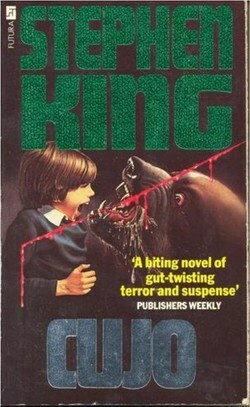 There is not really much more that I can say about Cujo without giving away too much of the plot and so, in the words of Popeye the sailor man: I have said all that I can say and I will says no more ugg, ugg, ugg, uggghhh!